I was quite hesitant to leave the house to go to my Saturday get-a-way, as I have been watching TV, following the update of the tsunami that would possibly hit Hawaii and the Pacific Basin. But, I don’t want to miss my week-end routine, to be at Barnes and Noble, so I went anyway. A few minutes after I got settled with my journal and books, along with my favorite Starbucks grande soy white mocha and sourdough Asiago pretzel, my cell phone rang. It was a call from my sister in Kodiak. She told me about the news, and she was concerned because Kodiak island where she and her family lives, will possibly be within the path of the tsunami. While talking on my cellphone, I subconsciously placed my hand on my waist belt and felt only the holster of my phone. “Where is my phone? Did I misplace it?” I suddenly panicked. As I continued to listen to her talks from the other end of the line, I was already rummaging my back pack, and checking the pockets of my jacket. No phone… I could not concentrate with our conversation, so I finally ended it. It was then, I realized… Dang! All the while, I was using the phone! I don’t know what has gotten on to me. Was I getting confused, or just pre-occupied, that I failed to tie up the equation: call = phone = answer = talk. I laughed at myself. But this is not a joke… It happened to me, it could happen to you. 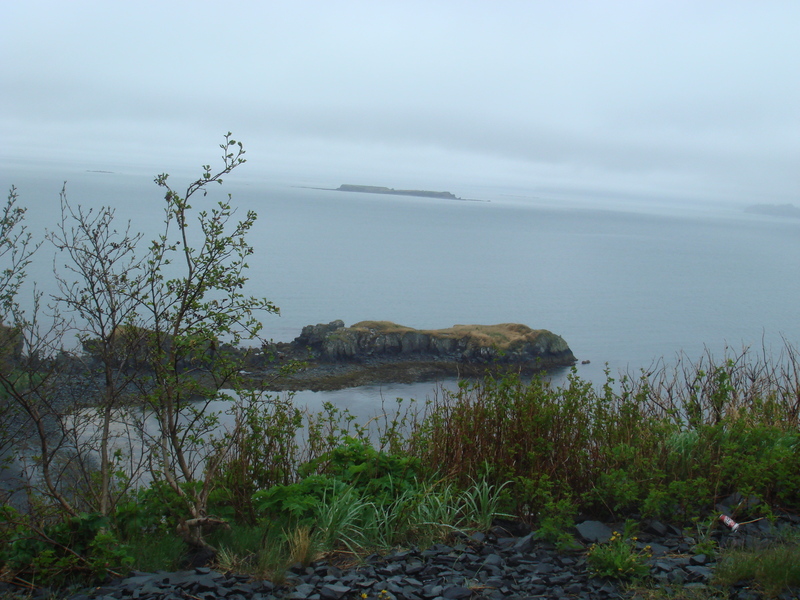 Kodiak is an island that can be reached via air or sea. It is a 45 minutes travel by plane from Anchorage. The island is so pristine and the natural beauty has been preserved despite of the fast-moving world of technology. About 12 years ago, I first visited the place. My sister and her family lives there. Since then, up to the time I came back, there were quite some improvements: like paved and expanded highways and side streets, new and bigger eateries and souvenir shops, cruise ships carrying tourists are now having frequent trips to the island. But, what remained the same was the scenic view of the breathtakingly beautiful snow-capped mountains and the bodies of water enveloping the whole island. What an ideal place to re-charge and commune with Mother Nature! During the next 5 days of my stay in Kodiak, it kept on raining, sometimes in heavy downpour, and windy. This was not the kind of vacation that I envisioned to be. But, the nasty weather did not keep me from going out and enjoy the day. Fully clad with thick parka hooded jacket, a cap, jeans, and rubber boots, I looked like a real Alaskan. Coming from the sunny California, I did not imagine myself to feel comfortable wearing this gear. The crab festival was a blast! 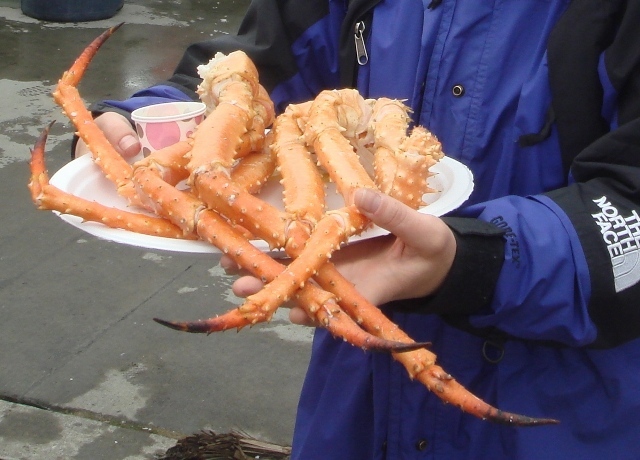 I feasted on king crab claws to my heart’s content. My sister prepared baked halibut and wild salmon. I also did get the chance to be up close and personal with a sea plane. Unfortunately, I was not able to take a ride and go whale watching. I was so scared to even try because of the gusty wind, rain, and fog. 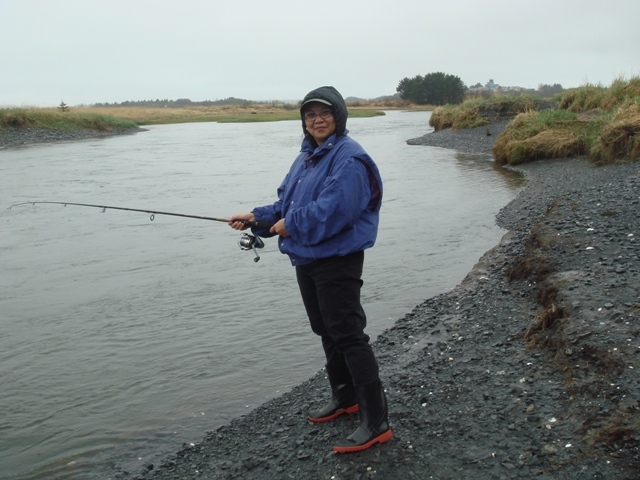 I also got the chance to go salmon fishing at Buskin River, but no luck. Perhaps the salmon did not want a Californian to catch them. My sister, her husband, and their two kids (my niece and nephew) took me to the places where I first visited 12 years ago. I felt so nostalgic. 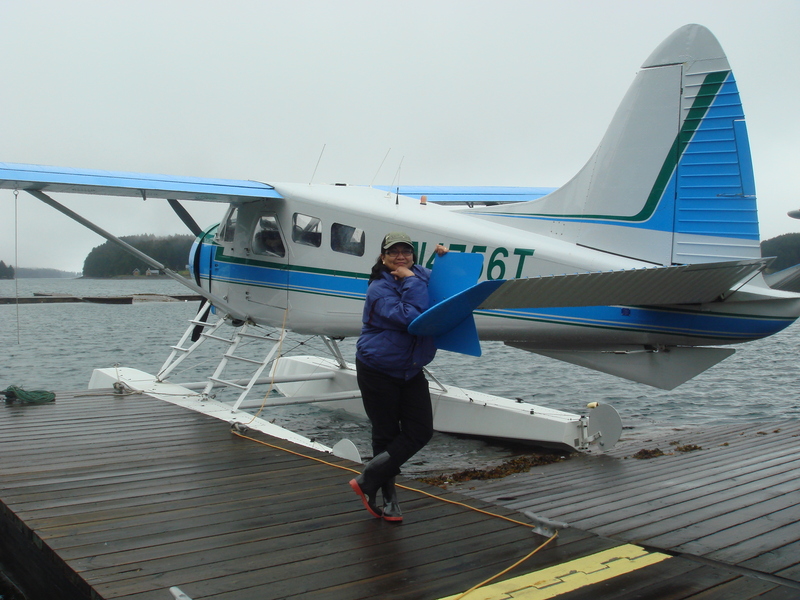 My 5 days vacation in Kodiak, Alaska was worth-remembering. It kept playing in my mind, while I was sitting at the airport in Anchorage, waiting for my plane to take me back home to California. It will take years, before I will visit the place again, but the memories: nature at it’s best, will forever be etched in my heart. My 8 years old “inaanak”(god-daughter) was already waiting for me when I arrived at the playground of St. Veronica’s Catholic School. It was their annual VIP/Grandparent’s Day. This morning, I was already at work, when my event calendar flashed an alarm. 20 minutes before the time. Today is the date…I forgot! I just finished with my morning staff meeting, and it’s a busy Monday. “Now, what will I do?” I have to be there. I managed to get permission from my Administrator to be away for at least 2 hours. The school is about 10 minutes drive from my work. I kept looking at my dashboard clock while driving. “I can do this. I can pull this through.” I kept talking to myself repeatedly. My mind was divided between driving and the thought of her, waiting and wondering whether I will show up or not. Then, one mishap happened…I missed my exit! Dang! It would be about a half mile drive to my next exit back, and it was already 10:00 A.M., the time I was supposed to meet her. Now, I’m driving faster than my guardian angel can fly. As soon as I parked in the school campus, I went to our meeting place. I saw her looking around with a worried facial expression. When I called her name: “Bianca!” her face suddenly lit up when she saw me, ran towards me, and gave me a hug. Inside the church, while the service was underway, she handed me a small card with her picture (and her brother’s. Both of them are attending school there). I just stashed it in my purse. After the church service, we had our picture taken. I then took her back to her classroom, and drove back to work. I’m giving them to you. With all the things you do. And always seem to care. They can always find you there. And given only to a few. Special people just like you. I was touched … and, it made the rest of my day! I received a summon letter for jury duty. The night before, I phoned to check for instructions. When I got through, an automated voice ranted so many questions and instructions, which of course, quite odd to think that you are talking to a machine.The final words were: “You are on telephone stand-by. Please call again tomorrow at 11:45 A.M. for further instructions.” “What? Great!! !” I said to myself. I went to work the following day, and at about 20 minutes past eleven, I again contacted the telephone number listed in my summon letter. The automated instructions prompted me to report to the Hall of Justice building, in San Mateo County, a 30 minutes drive from my work. I have to be inside the building by 1:00 P.M. As soon as I got to the address, I could not even find a vacant free parking space. Darn! Now, I have to purchase a parking ticket; otherwise, I will have a parking violation. There was a long line by the entrance of the building. Perhaps, these people were also reporting for jury duty. Everybody had to go through security check: “Put all your belongings in the plastic container, including belts, cellphones, no sharp objects, etc.” the guards instructed us. I remembered going through the airport security, but here, the personnel were all law enforcement agents. Of course! this is the County Superior Court. It was already 3:00 P.M. and most of us were already restless. Still waiting to be called. We were not allowed to leave the room, except when going to the restroom or to the restaurant adjacent to the waiting room, as anytime, our names may be called. It’s good I brought a book to keep me occupied. As the hours ticked away, all of us who were left in the waiting room were getting bored. Finally, at around 4:45 P.M., the presiding judge of our group came to see us. She was still young, or at least she looked young. She seem nice, contrary to my preconceived impression of a judge: a stern-looking person who wears a black robe and holding a gavel, sitting in the middle of a courtroom in an elevated podium. She was apologetic for the hours of waiting, and thanked us. She said that our group doesn’t need to go through with the trial, as the case was resolved. That’s it? After those long hours of waiting? Well, I told myself: at least I got the experience of the preliminaries of jury selection. Until next year, again? Who knows, the next time, I might go through the whole nine yards. It’s my day off from work, today. In my mind, I have already lined up the things that I will do at home, and the errands I have to make. The first one in my list: to send money to the Philippines, for my daughter’s allowance. I left the house early. My first stop was the remittance office. When I stepped inside, I could see that it is a busy morning. There were quite a few people in line, and all the clerks in the counter were attending to clients, to process their transactions. Balikbayan boxes occupied most of the floor space, up to near the area of the customer’s counter. After about 10 minutes of waiting, and was done with my turn, I stepped back from the counter, and turned to leave. Unfortunately, I overlooked one big box, and hit my left foot. I was thrown off-balance, and the next thing I knew, I was kneeling with both hands planted on the floor to hold me up. All eyes were simultaneously focused towards me, as one lady asked: “are you alright?” “I hope nothing’s broken”, I heard another man spoke as he came towards me, to help me up. “I’ve been telling them not to put those boxes there”, said one lady in the counter. I could feel extreme tingling sensation on my left knee and pain on my right shoulder, but managed to smile and gather my strength to lift myself up from the floor. “I’m ok”, I said. I tried to maintain my poise as I leave the office. I’m positive, I will spend the days ahead nursing my painful shoulder and my left knee will show abrasions and maybe, a big bruise. It’s my friend’s birthday today! This would be the happiest day of her life, because she received two precious gifts: her gift of life, and a gift of a new life that is slowly growing inside her. Cora, the person whom I knew for a long time is more than a friend to me. She is also a dedicated co-worker, a sister, and a confidant. I even stood as a sponsor in her wedding. All through these years, we have shared a bond that’s just getting stronger. She had been through good and bad times, and I was a witness to all these. Love, strong faith, courage, patience, and determination. All these attributes rolled into one, spells CORAZON…HEART. Her name says it all. What more could she ask for? The greatest and the ultimate gift that she had been patiently waiting for, was given to her, in God’s own time. Happy Birthday, Cora! A little girl, about 4-5 years old was standing a few paces in front of me. Her beautiful long blonde hair was blown by a gust of wind, sprawling over her face. She dipped her small hand into the pocket of her denim skirt, and out came a pink, round, rubberized ribbon. She started to gather her hair, and clasped them with her tiny fingers. Holding the ribbon with her other hand, she started to slip it, and tied it in her hair, several times, to tighten. Not completely satisfied with the result, she removed the ribbon off her hair, and started the task again, and again, and again. I could not keep track how many times she tried the task, until finally, her hair was tied in a beautiful bouncy pony tail. I could not see her face, but I surely could imagine a smile of satisfaction and a feeling of pride in her heart.